Organizers are ready for one of the biggest, and most continuous events of its kind in Salina and the Midwest. Girl Scouts of Kansas Heartland is inviting the public to kick off the holiday season by shopping at the 52nd annual See & Sell Holiday Market and supporting Kansas Girl Scouts at the same time. 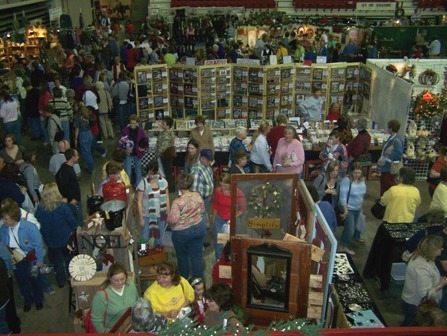 This popular arts and crafts show, which attracts 3,000 shoppers each year, will be from 8 a.m. to 4 p.m. this Saturday at the Tony’s Pizza Events Center. Nearly 200 vendors will be selling a variety of gift items, crafts, home decor, clothing, jewelry and accessories, bath and body products, holiday decor, kitchen and food items, floral, children’s items, and much, much more. The first 100 shoppers through the door will get a See & Sell goody bag containing coupons and special offers for area businesses. Tickets for the 52nd annual See & Sell Holiday Market are $5 at the door, and children ages 12 and under get in free. Proceeds from the gate and booth sales support Girl Scouts in 80 Kansas counties. For more information, go to seeandsellshow.com or call 1-888-686-MINT (6468).